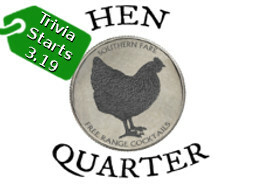 Hen Quarter in Penn Quarter starts trivia tonight (3.19) at 7pm. You should attend because 1) Chicken and other delicious southern-inspired menu options 2) Whiskey 3) Trivia is fun! Don't miss out on your chance to win great prizes. As always, trivia is free to play!